“Agu” is a traditional breed Okinawa indigene pig and is very precious. The history is very old, it is said that about 600 years from now it was first introduced from China, and since then the pig that the Okinawan kept is the beginning. “Agu” has supported the diet culture of Okinawa. But during the World War 2 the “Agu” dramatically decreased. Furthermore, after the war, the Americans introduced in large numbers, a more fast develop and large in size West breed, the pigs were modified. So the small and late develop “Agu’s” number deceaced, also the cross breed with the west breed, mongrel, advanced. Although the “Agu” was thought to be extinct, do to Nago museum’s research of all provincial in 1981, they found about 30 “Agu” pigs. And of 18 the “Agu” pigs were sent to the Okinawan state Hokubu Nourin high school to back crossing and clear out the mongrel spending about 10 years. Thanks to their effort, they were able to restore the”Agu” pigs to similar, before the war, ”Agu” pigs’ size. 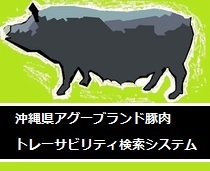 Ryukyu King ”Satto” dispatched an envoy to Min(China) and bring back the pig. 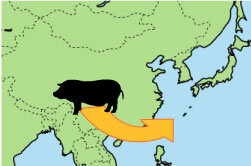 When coming back from Fukensyou (China) to Ryukyu, introduced the pig and pig farming technique. Agriculture department and the department of Commerce introduced “barksya” pig, and used to improve the “Agu”. Due to World War 2 the pig number decrease, introduce the west breed(“Agu” pig nearly Extinct). Restore similar size “Agu” pig before the war.